Wrestling komodo dragons, ethereal egrets and thirsty squirrels are among the creatures captured on camera by this year’s finalists of the Wildlife Photographer of the Year 2015 exhibition opening at the Australian National Maritime Museum on June 23. On loan from the Natural History Museum in London, the world renowned exhibition showcases 100 awe-inspiring images from fascinating animal behaviour to breath-taking wild landscapes. The international tour spans six continents and allows the images – including the winning pictures – to be seen by millions of people. This is the first time the exhibition will be held at the National Maritime Museum while touring Australia. The Wildlife Photographer of the Year competition launched in 1965 and now receives over 42,000 entries from 96 countries highlighting its enduring appeal. There are 21 categories for both adults and younger photographers exploring the world’s natural environment. Judged by a panel of industry-recognised professionals, the images are selected for their creativity, artistry and technical complexity. One of the winning images is by Australian author, explorer and conservation photographer Michael Aw. His image entitled A whale of a mouthful shows an imposing Bryde’s whale, ripping through a mass of sardines and gulping hundreds in a single pass. Canadian amateur photographer Don Gutoski was named Wildlife Photographer of the Year 2015 for his image Tale of two foxes, a beautiful but haunting portrait of the struggle for life in the subarctic climes of Cape Churchill, Canada. The Australian National Maritime Museum, in Darling Harbour, is open from 9.30am to 5pm daily. All enquiries (02) 9298 3777 or visit www.anmm.gov.au. Just half a day’s drive from Adelaide you’ll nd an incredible national park that is rugged and beautiful and simply transforms with every visit. Lisa Nunn ventures into this incredible place that lures photographers, adventurers, wildlife enthusiasts and travellers from around the world. There are many bee-eaters on this planet, but none compare with our beautiful Rainbow Bee-eater. John Cooper not only magically captures them in pictures, he tells us all about this bird of dazzling colours. because this unique island has provided the perfect island for a snake hideaway. There are 80 species of whale worldwide, of which 40 can be found in Australian waters. Whales are a marine, air-breathing mammal. Their general movement and migratory patterns may follow seasonal weather, water conditions and the movement of their main food, krill, which live in the cooler waters off Antarctica. According to some estimates there are 10 to 20 million people who will engage with whale watching each year. The revenue generated by this industry is thought to be nearly $1 billion. As a tourist attraction, the industry is expanding across the globe in places like the United States, Dominican Republic, Canada, South America, South Africa, South Pacific islands, Panama, Mexico and, of course, Australia. A chance find of a new snake species in Western Australia sent reptile lovers into a frenzy. Could this be the most deadly of them all? but rating snakes is not as easy as it seems, as luke Allen explains. so many reptiles to be spotted up there, and Jasmine Vink doesn’t shy away from these encounters of the herpetological kind. or naturalist, we hope you are taking time out to discover or further explore our country’s glorious wildlife. 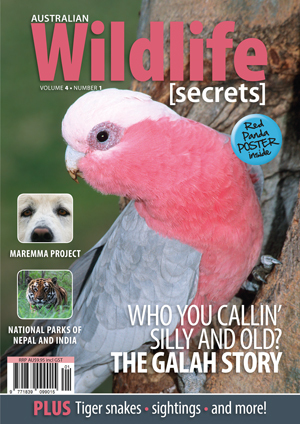 In September this year, our magazine was shortlisted for the coveted Maggies award in the Science and Nature category. In our regular newsletter, we told you of our nomination and asked you to vote for us. And, boy, did you respond! In November we were voted the winner of this category for our Vol3 No5 (Fungi) cover. A very big congratulations to our magazine designer, Jean Watson, and of course to John Cooper, for his stunning cover photograph and article. So what better way to end the year than with another Cooper spectacular? This time around, John shows us a “galah” time with these Australian iconic parrots as you have never seen them before. Also in this issue, Simon Fearn highlights the resilient and adaptable Tiger Snake. It has an intriguing ability to adapt to environmental pressures, both natural and unnatural – and the pictures are jaw-dropping! Can dogs and penguins live in harmony? This issue features the wonderful Maremmar Guardian Dog. Discover how the skills of this amazing Italian breed have been harnessed to save the Little Penguin. In our Overseas Secret Places article, Grant Szuveges explores Nepal and Northern India’s famous parks, showcasing the exotic wildlife for which these areas are known. Many thanks to all our readers for your support through the year, and especially for voting for us in the Maggies. We look forward to sharing this coming year with our wildlife friends and in 2015 we will continue to fascinate, inform and delight you. We wish you, your family and friends (including those feathered, scaly and furry) a relaxing and safe festive season! Vol 3 No 3 OUT NOW! 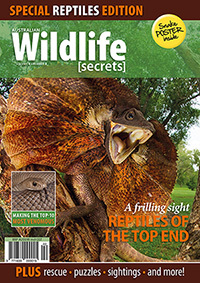 At Wildlife Secrets we can’t quite believe that 2013 is drawing to a close. We have now been in publication for 21⁄2 years! It’s been such a joyous ride but we couldn’t have done this without our wonderful photographers, editorial staff, sponsors and advertisers and, of course, our loyal readers. As a holiday season gift to you, we have a fabulous subscription offer to help ring in the New Year. you’ll pay only $49.95 instead of the usual $55—plus you’ll receive a bonus magazine, free! 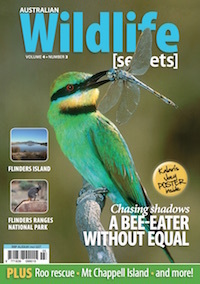 Hurry to our website at www.wildlifesecrets.com.au to take advantage of this limited-time offer. a dignified propriety, as Dr Peggy Rismiller explains. The winner of the EarthWatch Expedition Competition, Tony Egan, tells us about his amazing time with the team in north Queensland’s tropical rainforests. Lisa Nunn introduces us to the amazing Fogg Dam Conservation Reserve, a wetland haven for wildlife, particularly waterbirds. As Peter Ward discovered, nature can throw up some truly astonishing relationships and this wildlife friendship will intrigue and delight you! Our resident vet Dr Tristan Rich provides extraordinary insight into the range of available treatments for damaged turtle shells. Felicity Wishart explains why the Great Barrier Reef is under threat from something quite avoidable, and how one of our best-known wildlife warriors, Bob Irwin, has joined forces with the Australian Marine Conservation Society in what is shaping up to be a monumental fight for the reef. These are just some of the many superb articles in this issue. We hope you enjoy them as much as we have enjoyed preparing them for you. 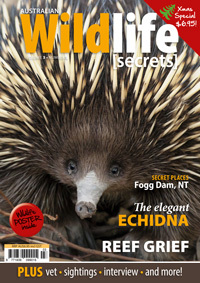 We wish you, your families and your friends a safe, happy and relaxing summer and look forward to bringing you more inspiring, captivating and informative issues of Wildlife Secrets in 2014.